Our tiny, 32 seat spot is comfortable and lived in, humble and well worn; in the morning it smells like blueberry muffins and fresh ground coffee; in the evening, buttermilk fried chicken and waffles. All day and night it sounds like latin-southern-blue note jazz. When we began, we were a small wholesale baking company with a storefront and a few loyal neighborhood customers who lingered over coffee and muffins and tapped out on their laptop keys (before smartphones were born). These days, most folks know Neil’s pancakes are voted best in the city, but it’s his savory roots that ground our menu and make us proud. People call it “comfort food,” but what we dish out is American Classics made with the highest quality ingredients, locally sourced -- whenever possible -- with lots of love (and butter). A co-owner of Clinton St. Baking Co. and Community Food & Juice, DeDe enjoyed a decade long career as an editor and writer for national magazines before switching to the restaurant life. Her Clinton St. Baking Co. Cookbook was named a best of NY Times’ 2010. From 2012 to 2016, DeDe proudly served on the Board of Directors of New York Sun Works (www.nysunworks.org), a non-profit organization that builds 21st century hydroponic greenhouse science labs in urban schools. 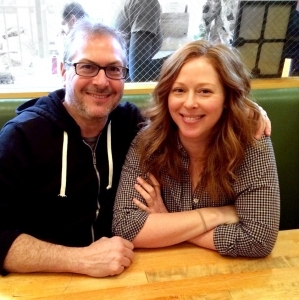 Neil and DeDe first met randomly as patrons at A Salt and Battery -- the takeout fishχps shop in Greenwich Village. Ten months later they were married, with restaurant.